Ev and I had people over a few weeks ago to welcome a couple of friends to Seattle and we decided that it was going to be too hot to have the oven on all day to prepare our usual dinner party staples. What to do, what to do? We’re nearing the end of Sockeye Salmon season here in the Pacific Northwest (*sobs uncontrollably*), so it’s the perfect time to get our Sockeye fix in while we can. 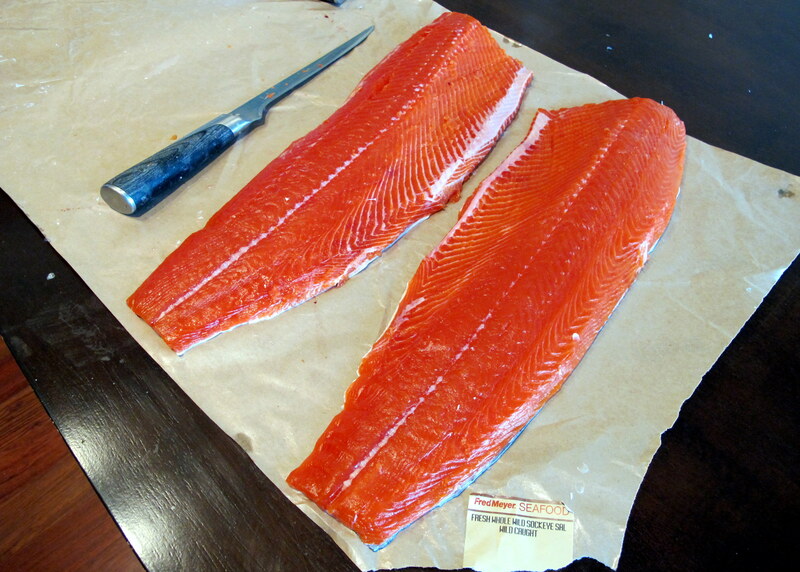 In my humble opinion, Sockeye is the best value salmon you can get, at least in Seattle, in terms of taste for the price; and just take a look at the colour of this beauty! You can’t beat wild caught salmon. Once your salmon has been filleted, there is very little prep work involved with this dish, making it a quick and easy meal to cook for a lot of wow factor. The beauty of this cooking method is that you don’t have to adjust it much for a smaller fish, especially if the fillets are the same thickness. The skin and the foil help to keep the moisture in – you’ll just need less marinade. Lemons are a low FODMAP fruit. Fennel leaves are low FODMAP in servings of 1/2 a cup. 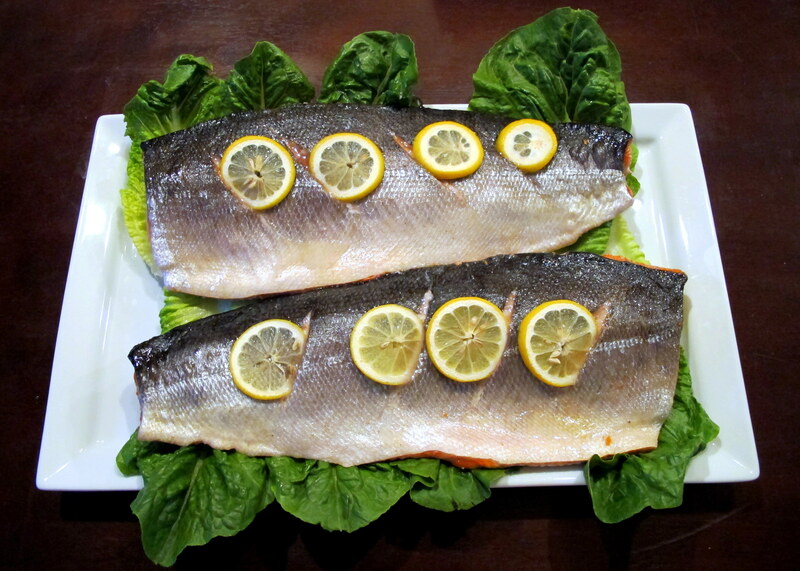 Fresh fish will always taste best – a fresh fish shouldn’t smell of much at all. If your fish smells “fishy,” it probably is. We normally buy whole fresh fish, as they are considerably cheaper per pound and you can make stock with the skeleton. 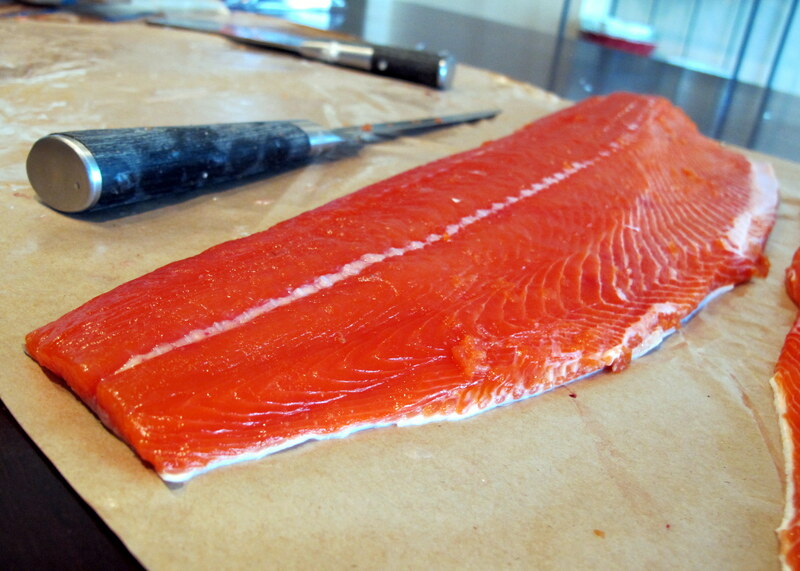 Clean and fillet the salmon, if it has not already been done – leave the skin on. Rinse and pat dry the salmon, before slicing 4-5 x 1 cm deep slices into the skin. The skin can be a little tough, so this will require a sharp knife. Wash and dry the lemons and fennel sprigs. Next, slice 3.5 lemons into rounds and juice the remaining half. 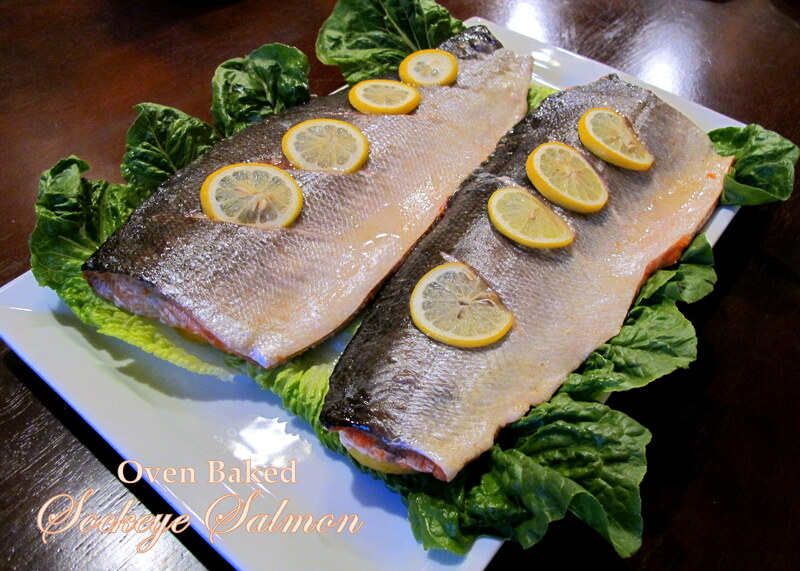 While your hands are clean, get a baking tray ready and line it with baking paper, before laying out two rows of lemon slices and fennel sprigs, on which you will later bake the salmon. Reserve 8-10 lemon slices for the garnish. Briskly combine the olive oil, lemon juice, sea salt, black pepper and cumin together to emulsify the ingredients and then rub the mixture thoroughly all over both sides of the salmon fillets. 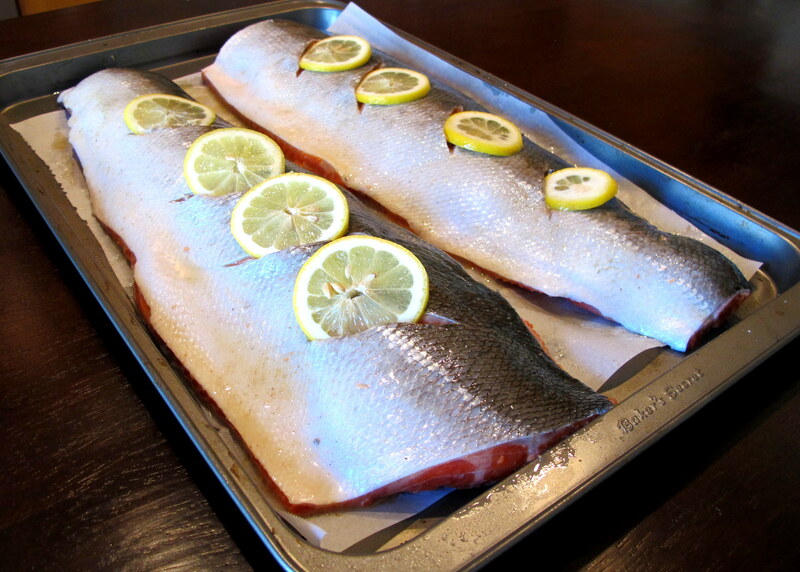 Lay each fillet skin side UP on the rows of lemon/fennel and cover the tray with foil. Store in the fridge for at least one hour, to let the marinade work its magic. Preheat your oven to 180 C/350 F. When ready, place the covered baking tray on the middle shelf and bake for 20 minutes, at which point you will remove the foil and bake for a further 10 minutes. 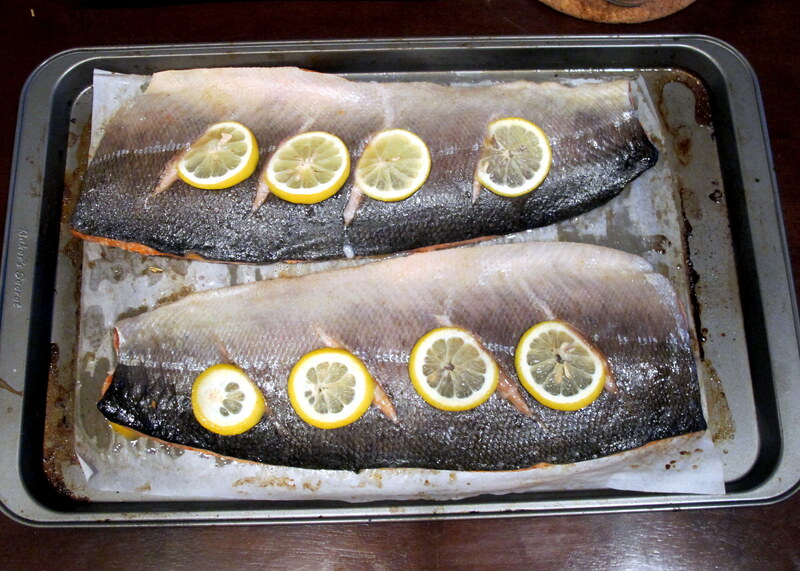 The fish will be perfectly cooked and flake apart, so be careful when you move it to the serving dish! To serve, lay out a bed of greens on a long plate and carefully transport each fillet to the dish, along with the lemons/fennel, if you wish. The skin will peel off easily, if you don’t like to eat it and the simple marinade really enhances the flavour of the salmon. I could eat this every day. This entry was posted in Carnivore, Dinner / Mains, Seafood Mains and tagged dinner, eat clean, fish, FODMAP, FODMAPS, food, fresh, fructose friendly, fructose malabsorption, fruit, gluten free, healthy, home-cooked, homemade, low fructose, low sugar, Pacific Northwest, paleo, pescetarian, primal, salmon, Seattle, sockeye salmon, wild caught. Bookmark the permalink.